Happy Thursday!! T minus 2 days until we leave for a week at the beach. I cannot wait! It is the first time in years Nick and I have gone for a whole week. Hayden always goes down earlier and we usually come mid-week. This year, we’re there all 7 days and I am so excited! Here is this week’s Thinking Out Loud! The beach is calling our names and we have nothing on the agenda for the whole time we are there. We are planning on living it minute to minute and making it up as we go along. We’re taking our niece with us this year. She’s finally old enough for us to steal her and take her with us on vacations. It’ll be great for Hayden and we’re looking forward to spending the time together. 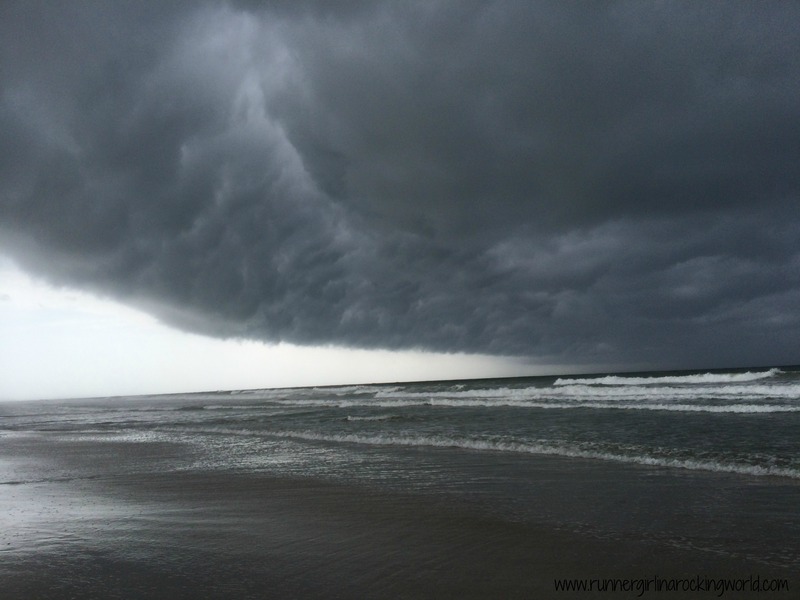 Last year we were at the beach, Hurricane Arthur roared through Topsail Island. We spent two days stuck indoors due to rain and storms. While it was an awesome (safe) experience, I’m super happy that it looks like we will have great weather all week. I signed back up for the Island Independence 5K. It’s held on July 4th (the day we leave). It’ll be a morning of decision whether or not I feel like racing it or not. I’ve not trained to race a 5K, so I’m a little nervous to bust it out. We’ll see… The heat and humidity will help me make a decision. I’ll see how my runs go over the week and see how I feel running at the beach. In other running news, I’m taking part in the Sweat Pink’s One Million Minutes. The goal is to run one million minutes as a community from June 21 to August 21st. You can sign up online to track your minutes. There are also prizes involved for keeping active. I’m kind of excited to see how many minutes I run over the 60 days. I track miles like a maniac, so total minutes will be kind of cool to see. All kinds of activities count too! My hour BodyPump class on Monday added 60 minutes to the total minutes. I’m on day 3 of the Clinical Teacher Academy (aka how to be an effective cooperating teacher for a student teacher) and it is going alright. Unfortunately, Cara and I are separated by grade level and we’re in different rooms. At least we have lunch together. Also, most of what we are taking about is relevant to teachers who have never had a student teacher. I’ve had 4 now so a lot of this is a review. I’m hoping that we can take year 2 together next Summer. So what’s new with you? What are you thinking about? Any vacations planned this summer? See what other people are thinking about too for Thinking Out Loud Thursday hosted by Running With Spoons. So exciting that you are getting ready for a beach vacation! Enjoy! Good luck with your 5K – trained or not, I’m sure you will do GREAT and have a blast! What a great shot you took of the storm on the beach, almost looks like a professional took it 😉 Good luck on the 5K, either way the results will be good whether you go out there and put all you have into it or just go out and have fun! I love the kind of vacations that don’t have anything planned. Where you’re just flying by the seat of your pants and doing whatever feels good in the moment. And holy.snap is that storm shot awesome. It’s making me crave a good storm — we haven’t had any this year! Yeah to beach vacations!! and family!!! Did you take that storm picture-totally cool!! added 30 min of jump rope and strength training this morning to #1millionminutes! I did take that pic. It was the craziest looking sky ever. Yes, plan a family beach trip! You will love it! I need to add my minutes up and get them logged in today! That top picture is crazy. We get big monsoons in Arizona but they don’t usually look so daunting. I’ve joined in on the 1000000 minutes challenge too. It’s great motivation! That was a scary looking sky!! Yay! Glad you joined the challenge too! We don’t take big vacations in the summer, because my husband works in construction and summer is the busy season for them. Usually, we go away to Wisconsin for a weekend or extended weekend. Right now I’m at my parents’ house in northern Wisconsin with my 15 year old. So many memories here! Oh I bet he is busy! This is the time of year when they get the most done. We just started this tradition last year with Nick’s side of the family. I’m so glad that we did! I'm a 41 year old mother and wife who is running and rocking through life. When moving across the country, it's important to stick to your roots...southern roots, of course. Follow my journey from Mile 1 to Mile 78..
Running, life, and all that comes with it.